The remains of a broch, 30ft in diameter within a wall 12ft 6 ins wide at base and 10ft in maximum height. A scarcement 10 ins wide encircles the interior at a height of 8ft, the masonry below this being more massive than above, and apparently bonded into the wall. The entrance passage, in the west is almost blocked with debris externally, but internally is still partly roofed and has a guard-chamber and one extant door-check. There is a mural chamber, now almost filled with stones, in the SW, and the remains of a probable intra-mural stair gallery are visible running round the northern half of the broch. Joass (1865) noted, at a time of low water, 'a regular, flagged way about twelve feet broad' running out into the loch until it was lost in deep water. J M Joass 1865; RCAHMS 1911, visited 1909. Visited by OS (W D J) 8 May 1961 and (J B) 21 March 1977. This broch, probably ground-gall-eried, is unexcavated and occupies a short, flat, projecting point of low ground on the north shore of Loch Naver; it is bounded by the water on two sides (visited 10/7/63 and 20/7/85). The building is three-quarters full of debris and nowhere stands more than 2.44m (8ft) high, though in the 1860s it was described by Joass as a "double-walled round tower" with walls about 12ft high . 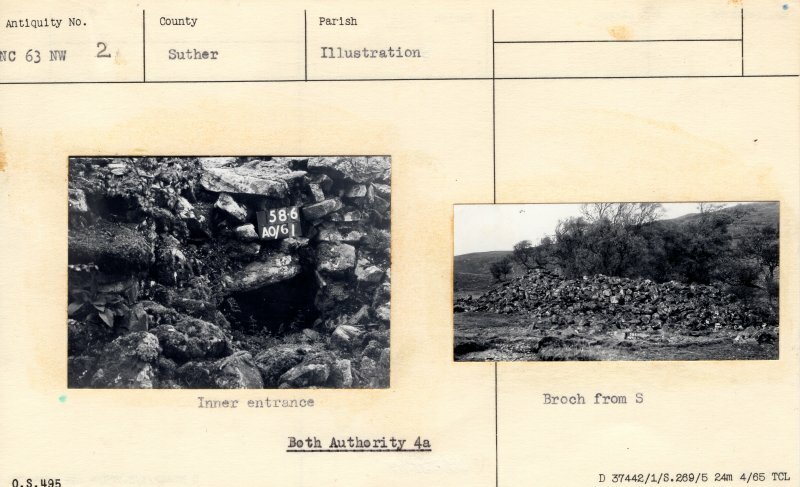 This description, and the evidence for a chamber over the entrance (below), is the justification for classifying the site as a 'broch' here. Joass also noticed a causeway running from the broch out into deeper water. The entrance is on the west side with the doorway to the guard cell visible on the right about 1.83m (6ft) in; part of the oval cell itself has been cleared, and there is a broken lintel over the inner end of its doorway to the entrance. There are now no signs of door-checks but the Commission reported one on the right, 1.07m (3.5ft) from the exterior . Several lintels are still in position over the inner end of the passage and one or two stones remain of the right side of the chamber over the entrance. A well preserved scarcement of the ledge type, but partly corbelled in places, is visible on the inside wallface. The top of another corbelled mural cell is visible at about 9 o'clock and the sides of a mural gallery can be seen running anti-clockwise from this back towards the main entrance At about 8 o'clock can be seen what appear to be some displaced lintels of this gallery and, since these are very little higher than those still in situ over the main entrance, they should belong to a ground-level gallery. At about 3 o'clock is a lintelled door-way in the inner wallface; the lintel itself forms part of the scarcement in the usual way. Another length of mural gallery, only l5cm (6in) wide at the wallhead (it has perhaps collapsed inwards), runs anti-clockwise from this opening and starts from a distinct built end. The wallhead here is about 2.l3m (7ft) above the ground outside so this gallery is also likely to be a ground level one. On the other side of this doorway, at about 4 o'clock, is the built end of another section of gallery (or of a mural cell) which has evidently stopped at this point because of the guard cell for the main entrance. Nearly 150 years ago Joass described the hollow wall as follows. "Access is to be had to the passage between the walls by a small, flag-roofed entrance opening from the interior of the tower" [3, 358]. in other words on top of the gallery lintels [4, 271]. These have since nearly all vanished. The structural features visible on this broch strongly suggest that Grum More has lengths of basal gallery in the wall similar to those commonly found in Hebridean brochs, and early descriptions seem to confirm this. The relative thinness of the wall increases the resemblance to many western sites, as indeed does the ledge scarcement. On the low, fertile ground around the shores of Loch Naver stand many modern farms as well as two more brochs on the opposite shore. Dimensions: (author's measurements): external diameter from 9-3 o'clock 16.47m (54ft), internal diameter here about 8.69m (28.5ft). The Commission gives the internal diameter as 8.85-9.15m (29-30ft) and the wall thickness at the entrance as 3.81m (12.5ft). Thus the wall proportion is about 45.5% from the Commission's dimensions , or 47.2 % from the author's. Sources: 1. NMRS site no. NC 63 NW 2 (the grid reference given is slightly too far north): 2. RCAHMS 1911a, 58-9, no. 174: 3. Joass 1864, 358: 4. Horsburgh 1868: 5. Swanson (ms) 1985, 749-52 and plan.